Being a small business certainly has its challenges. Most small businesses struggle with cash flow, staffing, regulation compliance, marketing and just plain keeping your head above water. As if it wasn’t enough, many small businesses find themselves trying to compete, survive and thrive in a retail world dominated by some of the largest corporations in America. 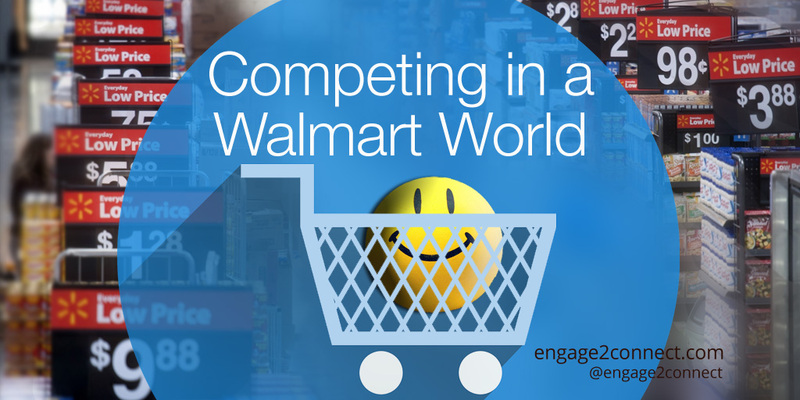 If you’re a small business, you’re competing in a Wal-Mart world today. Said another way, small businesses are competing with big box stores at just about every level. If your small business sells retail, commodity type products, then you are either seeing the impact on your business from Walmart, Target and other online retailer brands, or it will be coming to a city near you very soon. Big box stores such as Walmart, Amazon and Target result in several challenges for the small local retailer. As we’re sure you know, these challenges significantly impact your small business sales, revenue and growth opportunities. Whether large brand retailers are ethical or fair is an argument that we will leave to the experts and historians to discuss, but clearly understanding the obstacles your small local business faces as a result is crucial to your small business health and longevity. The key to out-maneuvering Big Box Stores in your local market is to know the weaknesses you have compared to these massive competitors, as well as the strengths you have to compete with them successfully. 1- Buying Power: You need to be realistic when you are looking at your small retail business. If you are selling commodity retail products that Walmart does also, you are already in a tough spot. Today’s consumers are extremely price conscious with retail products. They are bombarded online, through TV and mail with price focused marketing. Add to the fact that Walmart and Target have buying power and distribution capabilities well beyond your small business, you can likely never compete on price very well. Box stores buy at such incredibly large volumes, they can command much better pricing than a small business one or two case order can match. This buying power enables the big box stores to sell those products at a much lower price, thus continuing the consumers emphasis on price for the same item. Furthermore, big retailers can also cut their profit margins on certain products well below what is feasible for the local retailer, due to the sheer volume they sell. 2- Brand Recognition: Like the massive worldwide recognition that Coca Cola has garnered, Walmart and other big box stores are some of the most well-known brands in the USA. Each of these gigantic retailers are specifically known for a few important things. In most cases, that recognition involves some level of price, selection and brand experience. When your small business is not known by every single person in your market area like Walmart is, this creates a significant challenge to your business. The challenge becomes not just price and selection, but more importantly top of mind or branding. If consumers have been conditioned to think of a brand, subconsciously it becomes the first retailer they think of when the need to purchase arises. Add to that the ability to offer multiple products under one roof and price can become secondary to convenience. Big Box store one stop shopping is also seen as a plus with many consumers. 3- Marketing/Resources – Most large retail brands have multi-million dollar marketing and advertising budgets and that is just a fact. Additionally, they deploy seemingly limitless resources toward staffing, legal and operational business components that the local small business just doesn’t have. We know most of the small business owners reading this are screaming YES! in frustration at this point and we totally understand your pain. When you are out spent, out marketed and your products are over-priced as compared to the Walmart big box retailers, what is a small business to do? That really is the question, isn’t it? If your small business is going to survive and even thrive when you have big box stores in your area, the one thing you can’t or at least shouldn’t do is to continue what you are doing now. In other words, you are going to have to do something different if you are going to make it 5, 10 or 15 years from now when it only becomes more challenging to compete with big brands and other small business competitors. There are really 2 specific things that small businesses need to do to compete in the big box world of retail. Though there is entirely too much detail required and specifics that are unique to every small business, we believe the following will at least give you some direction and more importantly some badly needed hope. If your retail business is selling the same products, brands and services of your big box competitor, you will not likely win. For the reasons we discussed early, they will likely always beat you on price. And since consumers are more and more price focused with their purchases, this will only become more difficult. a. Selling unique, different and niche products that the big box store does not carry. Look for products that are new to the market, are not made by the same manufacturer, provide different, better or unique benefits to your consumer. If Walmart doesn’t carry it and you do, you are winning already! b. Actually be unique and different. Now we know that many small businesses think that they already are really unique and different from the likes of Walmart or Target, but you need to go deeper. Determine the needs around the market you are serving and find the niches that Wal-Mart cannot provide and Deliver What They Can’t! Maybe it’s free delivery or consultations that make you different. It might be the experience that you deliver your customers that can’t be felt at a Target store. Whatever that special something is that only your small business can provide, that is considered valuable to your customer (not something you think is valuable), focus on that. Test it, expand it and leverage it to compete with the box stores. If your local small business is going to succeed in this world of Walmart and big box stores, you have simply got to win on this point. You have a distinct advantage if you know how to use it. Being a local small business you are a part of your customers community and many are open to supporting you. But if your digital marketing isn’t up to par with what the savvy consumer expects today, then you will never capture their attention and earn their dollars. Use integrated marketing to break through the noise of your local community online through multiple channels like search, content, web, mobile and social media. Provide unique value to your audience using these channels that enables you to build relationships with your customers rapidly. Local marketing for retail businesses can actually be a significant advantage. Since the geographic area being targeted is so narrow, you can actually out-market big box stores online. By having an effective, targeted and multi-channel digital marketing strategy and executing it tactically online, your small business can not only survive big box competition, it can actually grow and succeed in spite of them. How can we help your small business compete?